24 cm  p. : chiefly col. ill.
Hans Christian Andersen's tragic tale of naive greed and dissatisfaction is retold through the beautiful and intricate illustrations of Finnish illustrator Sanna Annukka. Cloth-bound in rich forest green, with gold foil embellishments, The Fir Tree is a unique work of art. Sanna Annukka is familiar to many from her collaborations with Marimekko and her artwork for Keane's album, Under the Iron Sea. 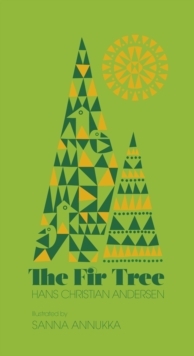 For her first book project, she illustrates Hans Christian Andersen's classic fairy tale, The Fir Tree. A beautiful gift to give and receive.